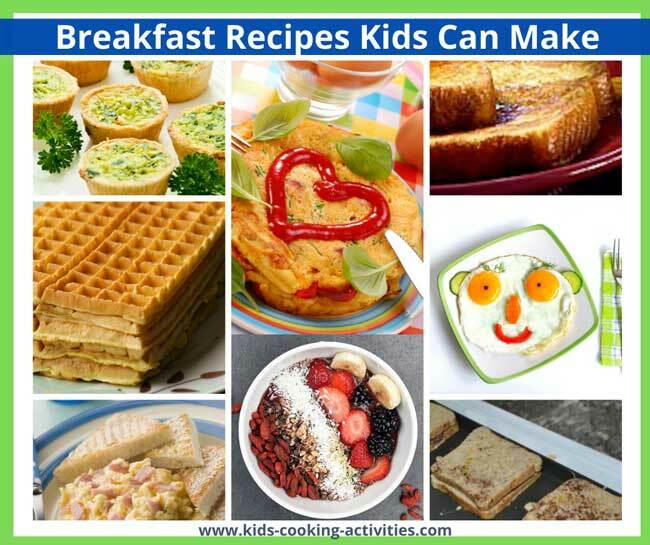 Quick and easy breakfast meals are something you need, if your morning is a crazy time and you want to feed your family the most important meal of the day. Morning at our house always involves me trying to wake up and get everyone ready for the day. I'm not a morning person so a lot of times we would end up having cereal or instant oatmeal. 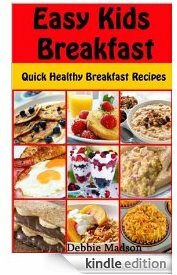 I jotted these ideas and easy breakfast meals and recipes down for my own quick reference to make breakfast easier. This school year I've tried to have a more healthy breakfast and I've implemented the following tips. It really has helped our breakfast time go smoother. Think and plan what's for breakfast before you go to bed at night. Even something simple like putting out the pan you are going to use and laying out a recipe, will help ease your morning. Even if you are doing something quick, like cereal, set out bowls and cereal boxes on the table before you go to bed. Over the weekend or during a non busy day make a large batch of muffins and freeze. Pull out and warm up at breakfast time. Serve with a fruit smoothie. Try some freezer breakfast meals. Eggs freeze well so you can make mini egg sandwiches with mini bagels, cooked eggs and a slice of ham. Wrap up and take out of the freezer in the morning and heat. Scrambled eggs always work well in the morning and you can add vegetables easily. Serve smoothies with your breakfast. It is a good way to start your day with fruit. Add ingredients to saucepan. Stir and cook on medium several minutes until boiling. Stir and cook until thickens. Serve with fresh fruit or frozen berries. 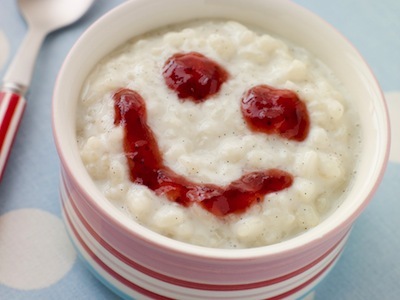 It is easy to make something like oatmeal fun! Heat waffle iron. Add all ingredients in mixing bowl. 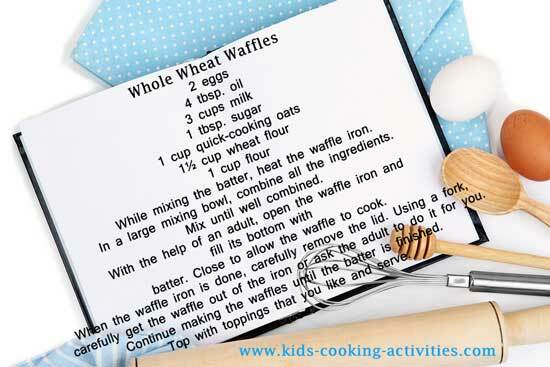 When waffle iron is heated add a scoop of batter into waffle iron and cook until brown. Serve with peanut butter, maple syrup or fresh fruit. Here are more waffle recipes such as Buttermilk, blueberry, gingerbread and more. Learn how to make Crepes! Blend eggs, milk and cinnamon in flat dish. Heat griddle. Soak both sides bread in egg mixture and fry on griddle. In a small glass or microwave safe bowl, crack open 1 or 2 eggs inside. Cook in the microwave 1 minute. Sprinkle with cheese and chopped ham or vegetables. Continue to cook until egg is set about 30 seconds or less. Serve with toast and fruit. Visit the Omelet Recipes Page to learn how to make omelets or try an egg casserole recipe for easy breakfast meals. This are great to make ahead and freeze. Pull out of the freezer in the morning and heat in the microwave 30 seconds -1 minute. In a mixing bowl, blend eggs (depending on how many you are making ahead of time) Add in any of the following ingredients you like. Blend together and pour into a muffin pan lined with muffin cups. Bake at 350 degrees for 20 minutes. Cool and place in baggies. Freeze for breakfast or snacks. 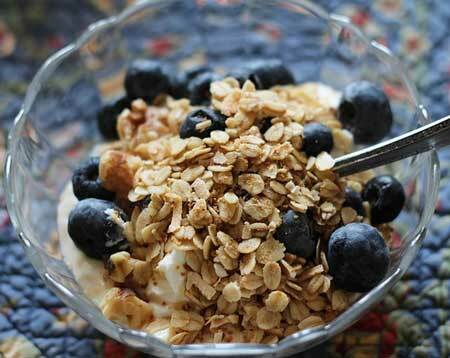 Make a batch of granola for an easy breakfast morning. 1. In a large mixing bowl, mix together dry ingredients: flour, sugar, baking powder, baking soda and salt. Set aside. 2. In a medium mixing bowl, whisk the buttermilk, oil and egg. Stir into dry ingredients. The batter should be slightly lumpy. 3. Heat a nonstick griddle over medium heat. Scoop about 1/4 cup of the batter for each pancake on top the griddle, allowing plenty of space for spreading. Cook until bubbles form on the surface, 2-3 minutes; turn and cook until golden brown, 2 minutes longer. Repeat with remaining batter; serve right away. 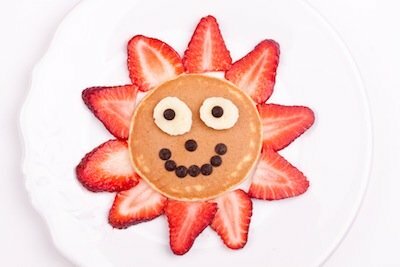 Decorate a pancake with strawberries, bananas and chocolate chips.More Pancake Recipes here. Here are 10 ideas on spreads to add to your easy breakfast meals. Mix sugar and cinnamon together and place in a shaker jar or plastic container. This is great sprinkled on homemade oatmeal too. Run ingredients through a food processor or if you have a heavy duty blender that will work better. If butter is too thick add a little more oil to thin mixture out. I love this inside crepes. Stir 1 cup of cottage cheese or ricotta cheese with 1 teaspoon or more to your liking of sugar or honey. Stir until well blended. Puree chopped fresh fruit, no need to add sugar. 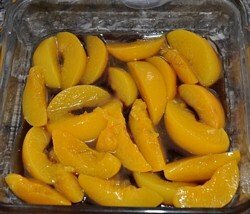 Or use sliced peaches, sliced pears or fresh berries for a spread or topping. Add butter and honey to small saucepan and stir together until butter is melted and mixture is well blended. You can also microwave in 30 second intervals. Try the honey butter recipe above and add 1-2 teaspoons orange juice. I found this recipe in the cookbook More with Less. I recommend this cookbook for a lot of made from scratch recipes. Stir in 1 Cup crushed pineapple and 2 tablespoons brown sugar. Heat 5 minutes, stirring until clear and thickens. Great on pancakes or waffles. Fruit flavored or plain yogurt topped with granola or chopped nuts. Another favorite of ours in crepes or waffles. More Pancake recipes here like Cocoa Pancakes, Banana Pancakes and Red Velvet Pancakes. Breakfast Casserole. On a weekend create a egg casserole and use the leftovers for breakfast on the weekdays. Yogurt topped with granola, fresh fruit or dried fruit. Cooked sausage, ham or bacon wrapped in a pancake. Make these the night before and just reheat in the microwave. Egg sandwich with tomato, bacon, ham or cheese. Try some Toast Variations. Instead of butter and jelly, how about trying pizza toast, fruit pizza toast or spread apple butter, honey or cream cheese on your toast. Place the apple and pear chunks together in a mixing bowl. Pour the lemon juice over the top and toss to coat the fruit well. Divide the fruit into 12 portions that contain all of the different kinds of fruit. 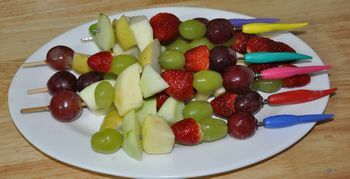 Thread the fruit onto wooden skewers in any order you like. In a mixing bowl blend together eggs, milk, vanilla and cinnamon. 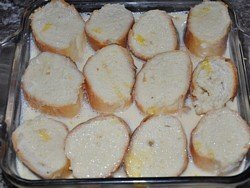 Spray a casserole dish with cooking spray and place slices of bread in a single layer of casserole dish. Place peaches on top of bread. Pour egg mixture over the top. Wrap in tin foil and store in the fridge until ready to bake. Bake at 400 degrees for 30-35 minutes or until golden brown. Mix together until crumbly. Sprinkle on top of french toast, then bake. 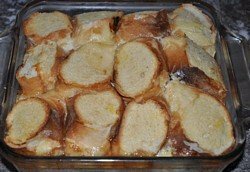 More French Toast Recipes here. 1 Cup oats 2 smashed ripe bananas 1 egg 1/4 Cup mini chocolate chips Stir together well and bake at 350 for 10 minutes. On to Easy Meal Ideas from Easy Breakfast Meals.